This time of year is crazy with kids going every which way with after school and evening activities. Who am I kidding, this is how it is all year long! Soccer practice, play rehearsals, volleyball games, basketball practices, you name it – we are running to all of these events every day. Instead of stopping to grab fast food, we opt to try and bring along dinners from home. So, if your evenings are anything like ours, you are going to want to continue reading! 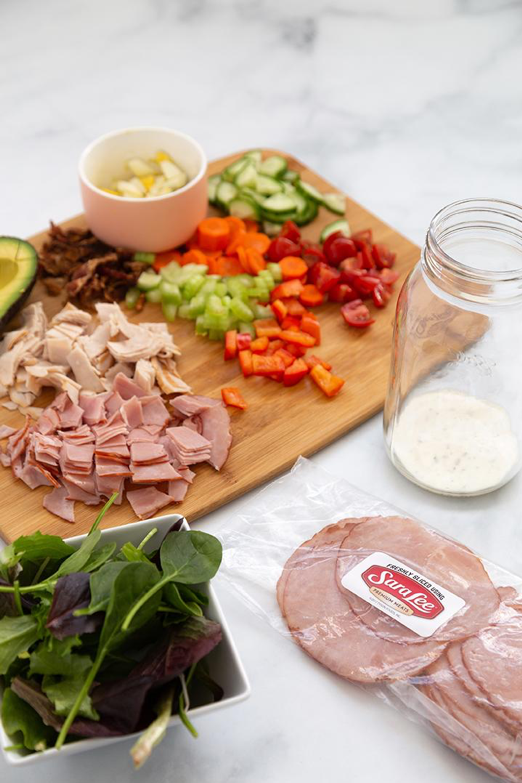 We partnered with Sara Lee® Premium Meats to share five of our favorite dinner on-the-go ideas. 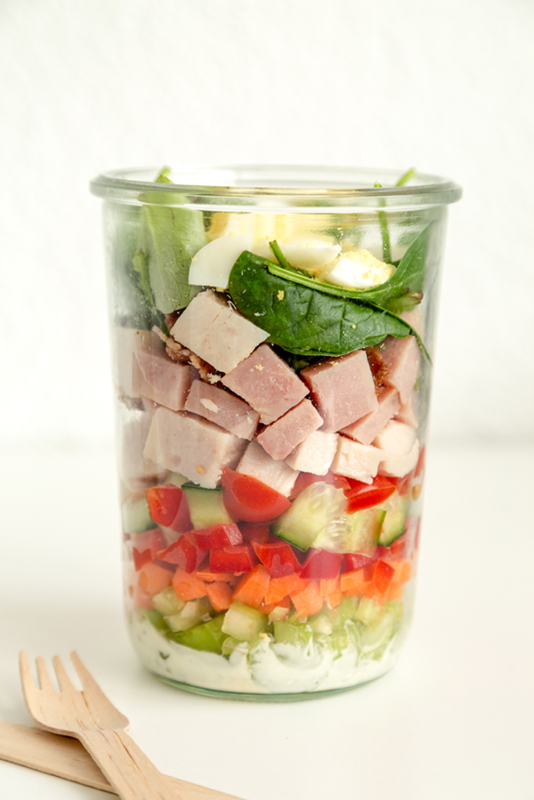 A Cobb Salad In A Jar is our absolute favorite at the moment! It is so good, tastes so fresh and it is so easy to whip together. 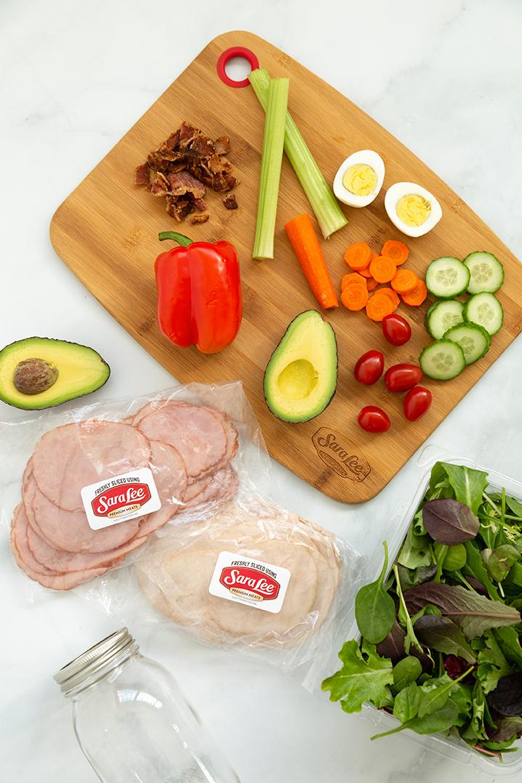 Sara Lee® Premium Meats is our go-to resource for quality deli meats that we can feel good about feeding our family. These deli meats are a perfect way to add protein to meals without all the fuss. 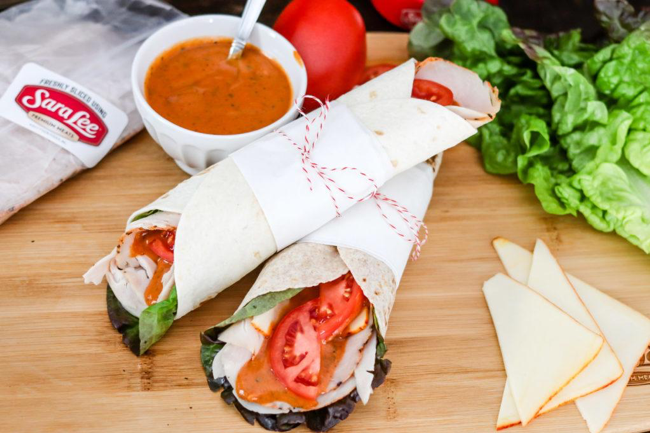 All of our dinner on-the-go ideas have Sara Lee® Premium Meats in them. Salads in a jar are so popular right now. You have probably seen them all over Pinterest and there are so many reasons why. 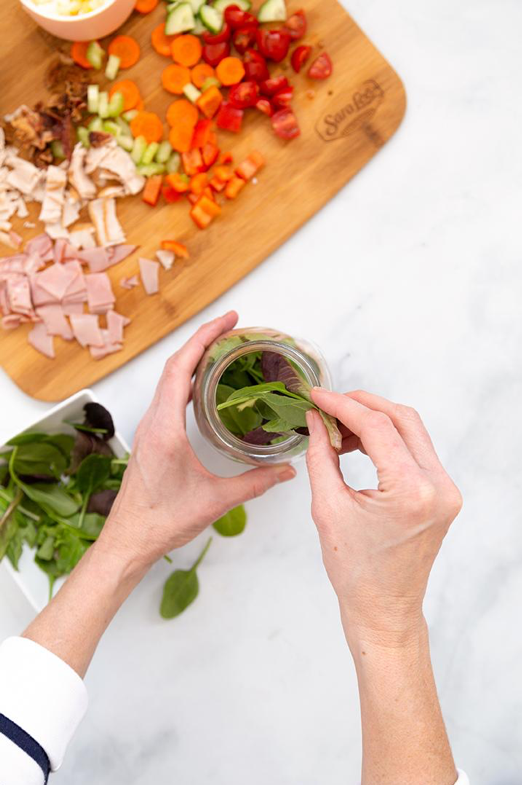 Dinners in a jar are portable, easy to make and easy to eat. 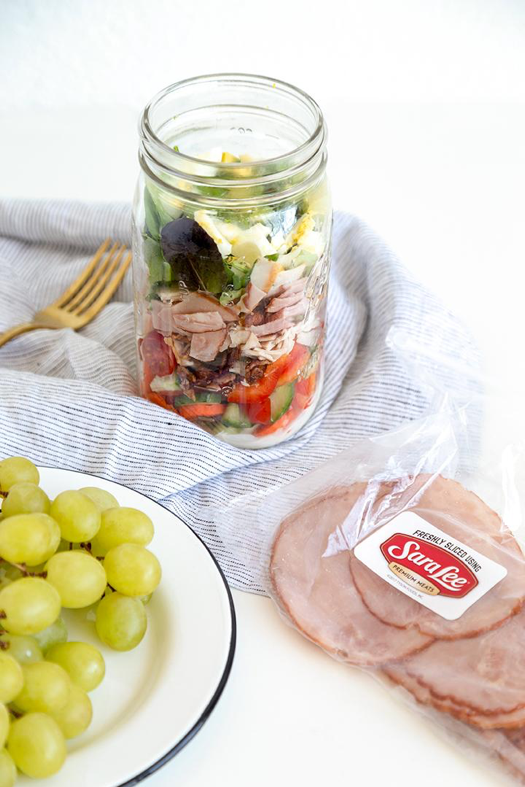 These meals in a jar are not just for lunch, we love to use the quart size mason jars to create dinners on-the-go, including a Cobb Salad using Sara Lee® Premium Meats. 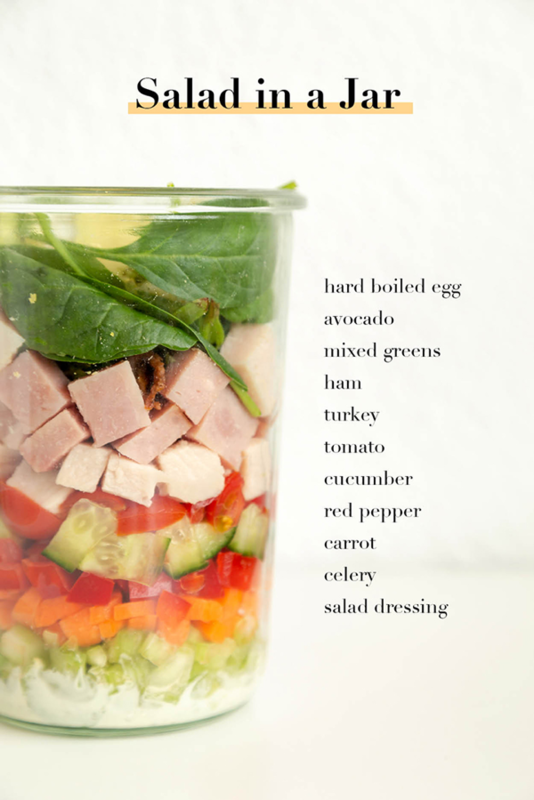 Here is our recipe for the Cobb Salad In A Jar. Start by pouring the salad dressing into the clean jar. Next, start layering to create the salad. You will want to put the veggies next (those that do not wilt). Add the chopped celery, carrots, cucumbers and tomatoes. Next, add the Sara Lee® Oven Roasted Turkey Breast and Sara Lee® Honey Ham. This adds excellent protein to the dinner salad. Now add the mixed greens. Then the avocado, egg and cheese. Add the lid and place in the fridge. Take them with you for your family on the go and all you need to do is shake the jar to combine the ingredients and salad dressing. Unscrew the top and dig in! You can eat them straight from the jar or toss in a bowl. 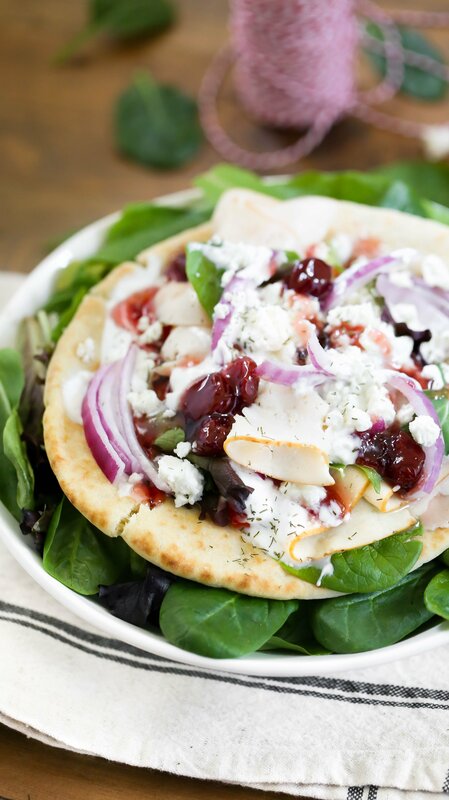 Here are a few more of our favorite dinner on-the-go ideas. I have listed the ingredients in the order in which you layer them in a jar. 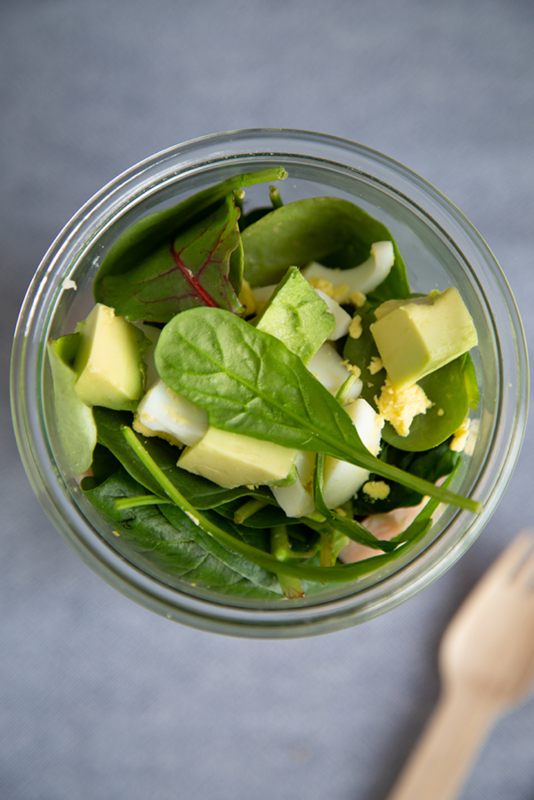 Again, we love using the quart size glass mason jars for these salads in a jar. Pesto Pasta with Chicken – Italian dressing, chopped artichoke, cucumber, red peppers, pesto pasta, Sara Lee® Oven Roasted Chicken, mixed greens, parmesan and mozzarella cheese. Antipasto Salad – Italian dressing, pepperoncinis, roasted red pepper, chick peas, Sara Lee® Oven Roasted Turkey Breast, Sara Lee® Honey Ham, salami, chopped romaine lettuce, shredded mozzarella cheese, and parmesan. Fiesta Turkey Salad – Spicy ranch dressing, black beans, corn, tomatoes, cucumbers, Sara Lee® Oven Roasted Turkey Breast, chopped romaine lettuce and avocado. Asian Chicken Salad – Asian dressing, chopped celery, chopped green onions, Sara Lee® Oven Roasted Chicken Breast, spinach, mandarin oranges and almonds. Thanks to Tyson Foods for sponsoring this post! If you are looking for delicious recipes your whole family will love, how-to videos, meal hacks & more, visit SaraLeeDeli.com! Turkey Tikka Masala Wrap Turkey Tikka Masala Wrap Greek Chicken Gyros Greek Chicken Gyros MVP GRUB FOR A KILLER BIG GAME BASH! 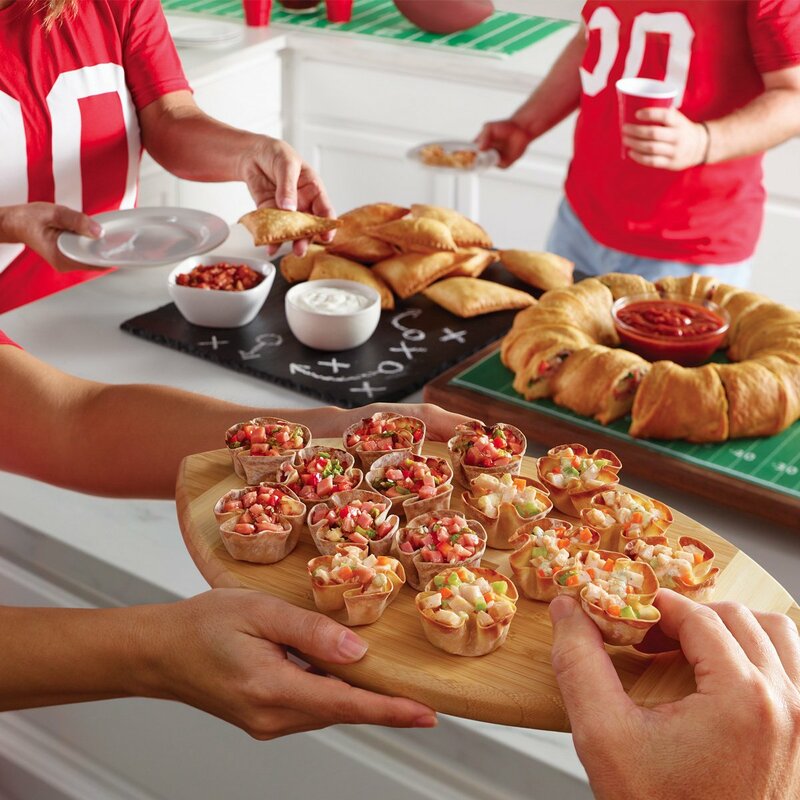 MVP GRUB FOR A KILLER BIG GAME BASH!